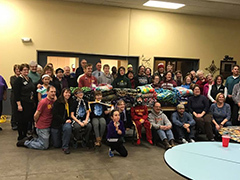 St. Paul’s United Methodist Church Foundation, an Iowa nonprofit corporation, was established by the church in 1975 to administer the church’s endowment and to identify and develop opportunities for further growth through current and legacy gifts. Since then the Foundation has provided over $2.5 million in support for church projects and ministries. Since its beginnings in the 1840s, St. Paul’s and its missions have been sustained by the commitment and vision of generous donors. St. Paul’s members give generously of their time and resources to support St. Paul’s vision of changing lives and affecting the local and global communities for good. The Foundation provides these generous members the opportunity to further their support and vision through current and planned giving. Foster a vibrant spirit of Christian stewardship and generosity to create a perpetual source of income which strengthens the financial capabilities of St. Paul’s United Methodist Church and thereby assists the church in fulfilling its stated mission: St. Paul’s United Methodist Church: a people GATHERED, FORMED, and SENT by God’s grace. Where does your heart lead you to give? Do you have a passion for or a special interest in a particular mission or ministry of the church? Or perhaps in some aspect of faith formation or worship? Learn more about existing funds contact Rev. Jerry Oakland, Executive Director, at 319-363-2058 or joakland@stpaulsumc.org. We are also happy to create new funds that align with your intent and St. Paul's goals. Additionally, gifts may be given to St. Paul’s through an endowed fund at the Greater Cedar Rapids Community Foundation to receive Endow Iowa tax credits. The Foundation gratefully accepts gifts of cash or securities, gifts made through bequests, charitable gift annuities, trusts, retirement assets, and life insurance. Learn more about ways to give to the Foundation. The John Wesley Heritage Society honors the dedicated St. Paul’s members and friends who have chosen to include St. Paul’s in their estate plan or who have made a current gift to an endowed fund. You can join the John Wesley Heritage Society when you declare a gift to the St. Paul’s Foundation. The Foundation is governed by a Board of Directors. All elected directors are St. Paul’s members recommended by the Board and approved at the church’s Annual Conference. Rev. Jerry Oakland is a retired United Methodist Pastor who has participated in the ministries of St. Paul's since 2011. Jerry and his wife Barb relocated to Marion after his retirement from serving United Methodist Churches in Iowa for 32 years. From 2011-2016, Jerry served as the Director of Development and Communications at Matthew 25 in Cedar Rapids. Since joining St. Paul’s, Jerry has been active in the Sanctuary Choir, Serendipity Class, and the Church Council. For more information on the Foundation or to discuss how you can make a difference in the future of St. Paul’s, contact Rev. Jerry Oakland, Executive Director, at 319-363-2058 or joakland@stpaulsumc.org. All inquiries are confidential. Get more information about Scholarships. Witness the many visible ways the St. Paul’s Foundation helps us answer God’s call for our church. Read the Foundation’s quarterly Messenger newsletter. Blanket tyers pose with the results of the day, a satisfying stack of blankets and some new friends.